Tamworth Osteopath John Williams has many years experience treating sacroiliitis and inflamed sacroiliac joints. Often overlooked as a cause of low back pain, the sacroiliac joint can be difficult to diagnose and treat. The good news is that Atlas Pain Relief Centre has developed a unique treatment plan to treat this condition and the success rate has been very effective over a 15 year period. Most patients are pain free and mobile in 6 treatments! Designed by Tamworth Osteopath and Physiotherapist the Atlas Sacroiliitis treatment protocol is unique and found knowhere else. The sacroiliac joint pain will show nothing when scanned by MRI or Xray and Consultants when faced with treating this condition tend to inject the joint with little effect. Far easier and more effective, the Atlas Sacroiliac Joint Pain treatment is safe, simple, painless and quick. We have launched a dedicated sacroiliac joint website. 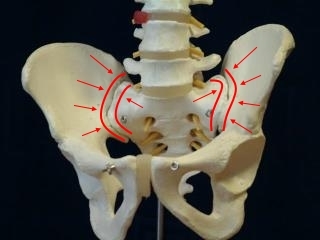 The Sacroiliac joints are located at the very bottom of the back. You have one either side of the spine. The Sacroiliac joints help make up the rear part of the pelvic girdle and sit between the sacrum (vertebrae S1-S5) and the Ilia (hip bones). The function of the SI joints is to allow torsional or twisting movements when we move our legs. The legs act like long levers and without the sacroiliac joints and the pubic symphysis (at the front of the pelvis) which allow these small movements, the pelvis would be at higher risk of a fracture. The concept of the SIJ causing lower back pain is now pretty well understood. However, due to the complex anatomy and movement patterns at the joints and area in general, evaluation and treatment of sacroiliac dysfunctions is still controversial. SIJ dysfunction is a term which is commonly used when talking about sacroiliac injuries. This dysfunction refers to either hypo or hyper mobility (low or high respectively). Or in other words, the join can become ‘locked’ or be too mobile. This can then lead to problems with surrounding structures such as ligaments and muscles, which means SIJ problems can cause a wide range of symptoms throughout the lower back and buttocks, or even the thigh or groin. What are the Symptoms of SI Joint Injury? There may be tenderness on palpating the ligaments which surround the joint. Traumatic · Biomechanical · Hormonal · Inflammatory joint disease. Traumatic injuries to the SIJ are caused when there is a sudden impact which ‘jolts’ the joint. A common example is landing on the buttocks. This kind of injury usually causes damage to the ligaments which support the joint. Hormonal changes, most notably during pregnancy can cause sacroiliac pain. In preparation for giving birth, the ligaments of the pelvis especially increase in laxity. Combining this with an increase in weight putting extra strain on the spine, may lead to mechanical changes which can result in pain. Spondyloarthropathies are inflammatory conditions which affect the spine. These include Ankylosing Spondylitis which is the most common inflammatory condition to cause SI joint pain.